The braiding foot is one of many types of feet used in couching, which is a form of decorative embellishment, where a length of braid, cord, piping, ribbon, thread, trim or yarn is couched or stitched over to attach it to a fabric project. This foot may also be called by different names, such as couching/braiding foot or braiding/cording foot depending on the sewing machine maker. Couching is actually a technique where the thread encases the embellishment by floating lightly over the embellishment without piercing the decoration. 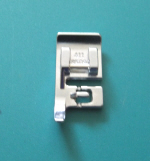 The braiding foot is used specifically to attach braid as an embellishment to a project. The foot has a hole in the top of the foot, allowing the braid to be threaded from the top of the foot and passed under the foot. Some braiding feet are adjustable for the size of the braid, having an adjustable guide that is moved to accommodate the width of the braid by loosening a screw and moving the guide. 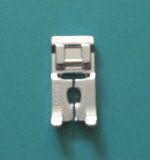 The braiding feet that have just a hole in the top of the foot, cannot accommodate braid larger than the size of the opening, since the opening cannot be adjusted. The type of stitch used is usually a straight stitch, zigzag or decorative stitch depending upon the type of embellishment that is being sewn. Braid is generally sewn to the fabric with a stitch right down the center of the braid. The foot is very easy to use, and although the sewing machine maker may be different, the foot is basically used the same way.